Great Blue Turaco is the largest species of the Turaco family. The adult has turquoise-blue upperparts, including wings and tail. The tail is long and wide, and shows a broad, black subterminal band. Most birds have narrow blue tips. The outer rectrices are partially edged yellow. The wings lack the crimson primaries of other turacos.On the underparts, neck and upper breast are turquoise-blue. Lower breast and belly are greenish-yellow, as the undertail feathers. The tail has black subterminal band. Lower belly, undertail-coverts and tibial feathers are chestnut. On the turquoise-blue head, there is a conspicuous blue-black raised crest on forecrown and crown. Chin, throat, cheeks and outer eye-ring are greyish. The large convex bill is bright yellow with red tip. The eyes are reddish-brown, surrounded by bare dark turquoise-blue eye-ring. Legs and feet are blackish. Sexes are similar. 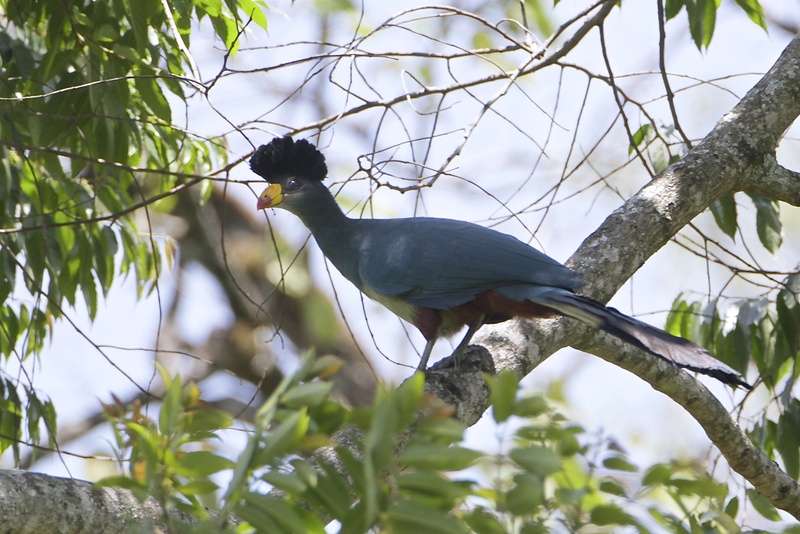 Great Blue Turaco have territories which are maintained throughout the year. Like many of the turacos, Great blues are rather shy and seldom descend to the ground except for drinking and bathing. They are quite agile when climbing throughout the branches. Seldom alone, they may be in pairs, family or social groups of up to seven individuals, with several groups often gathering at a single large fruit tree. 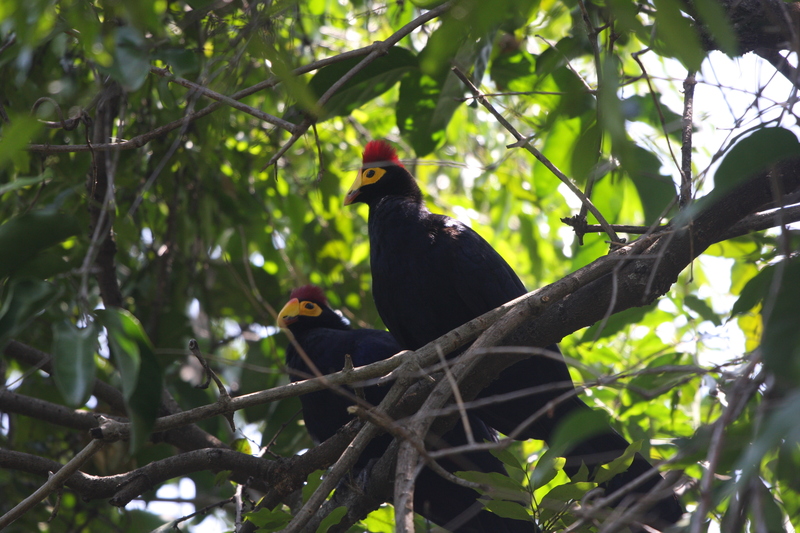 These turacos are not good fliers, flying short distances and soaring to lower levels of the forest. Courtship involves calling, chasing, feeding each other, raising the crest and the long tail. They call early in the morning and late in the afternoon. They best seen only in Kakamega forest in western Kenya and all the forest in Uganda.